We visited this park on February 2, 2017, and stayed for 28 day(s). 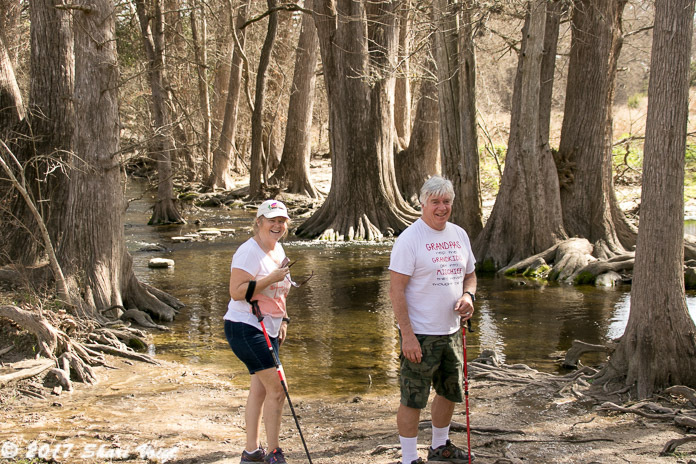 Medina Lake RV Campground is one of our favorite Thousand Trails parks. Our February 2017 visit marked the fourth stay in 3-1/2 years. It’s peaceful here. Our current site faces the lake and it’s a beautiful view to wake up to in the morning. Usually there’s a Great Egret, a Great Blue Heron, or a Kingfisher at the shoreline. Several herds of White Tail Deer roam the park, and they’re quite tame. 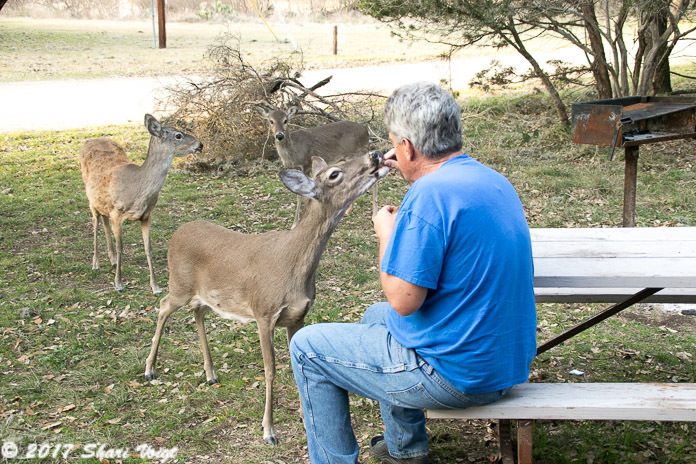 Everybody feeds them, and some will eat right out of your hand. Most feed them corn, but we picked up a 50 lb. bag of alfalfa pellets at the local feed store for about $11 because it’s better for them – and they’re making fast work of it. We’re also enjoying the plentiful Jack Rabbits, squirrels, Northern Cardinals, Tufted Titmice, Chickadees, Carolina Wrens, Roadrunners, and hawks. 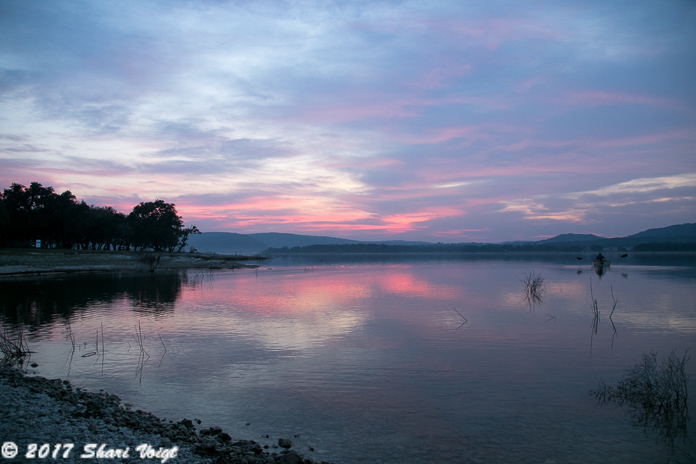 On our first visit in February 2014, Medina Lake was empty. We walked along the dry lake bottom. There was a dirt road through the middle of it. Last year (2016), the lake had mostly recovered, and to us it seemed full. But this year, it’s full to capacity. Recreational boating and water sports have returned and because of this, many more sites are in use at the campground. There are not a lot of 50 AMP full-hookup sites here. If you want 50 AMP, expect to pay an additional $3 per night. Most are 30 AMP full-hookup. The sites closest to the water are only two-point hookup with no sewer, but a honey wagon is available for a fee. 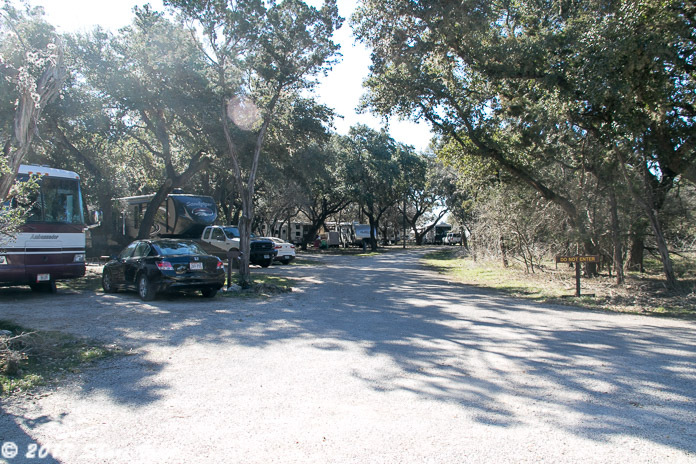 Medina Lake RV Campground has the typical Thousand Trails amenities: Pool and hot tub, laundry room, activity center with a cafe, mini-golf, playground, etc. In addition to campsites, they offer rental cabins that sleep up to four and getaway cabins that sleep up to six. There is a small town grocery store in Lakehills with a surprisingly good selection. For major grocery shopping, you’ll find HEB Plus in Boerne, Helotes, or San Antonio. It’s about a 30-40 minute drive to reach any of them. You’ll also find opportunities for hiking nearby. For more information on this park, visit their website.